60mm cut out ideal retrofit for most fixed low voltage and GU10 downlights. Opaque lens for diffused light. Non dimmable. 100 degree beam angle. 83mm overall diameter. 50mm depth. Average life 25000 hours. 240V no external driver required. This luminaire contains a built in non-replaceable LED of energy class A. 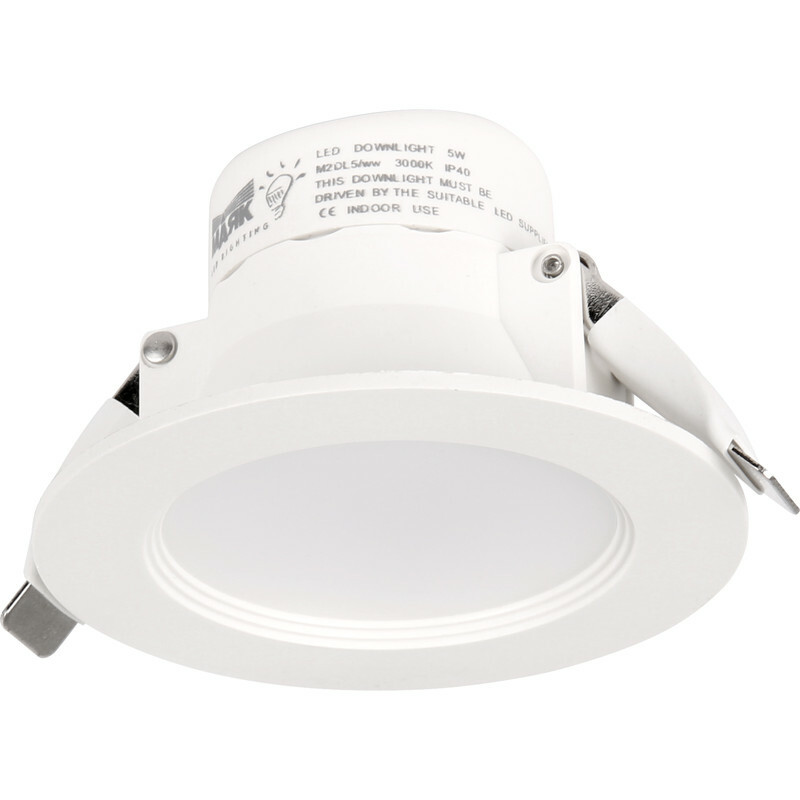 Mark Lighting LED 5W IP40 Fixed Downlight 5W Warm White 3000k 397lm is rated 4.8 out of 5 by 6. Rated 5 out of 5 by Ace oddjob man from Spot on!!! Just the job, took me 15 minutes to fit, looks great in display unit. Rated 5 out of 5 by KeironJ from Brilliant lights! Bought five of these so far, to replace existing rusting soffit lamps. My choice was limited as they had to fit the existing 63mm holes and most seem to fit 70mm, but these were just perfect. With plastic construction they blend perfectly with the uPVC soffit board, and no more rusting; excellent! Rated 4 out of 5 by JohnR48 from Bright, good price, compact Compact unit that was easy to fit although the wiring into the unit was a bit fiddly. Have fitted 8 in two bathrooms and pleased with result. Rated 5 out of 5 by Jem B from Easy win Bought these to replace old GU10 lights in a kitchen. Well made, very easy to fit - took me less than 4 minutes per light. Very good light coverage and colour, great product.